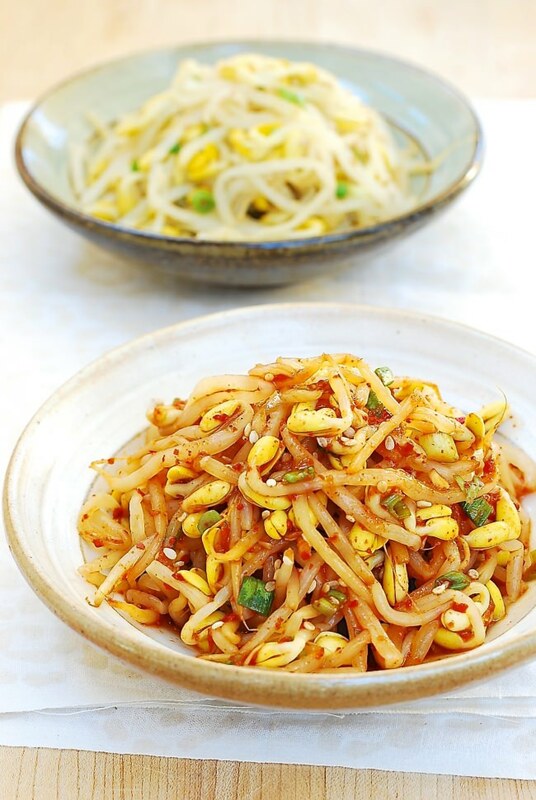 Kongnamul muchim (seasoned soybean sprouts) is one of the most commonly served side dishes in Korean homes. You’ve probably seen this dish among the array of side dishes served at Korean restaurants. 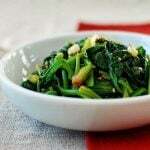 It’s also one of the classic vegetables used in bibimbap. 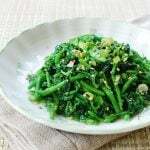 Usually, this dish is mildly seasoned to savor the natural nutty flavor of the soybean sprouts. It’s also very common to add gochugaru (red chili pepper flakes), along with a little bit of soy sauce, for a little spicy kick. Here, I am showing both ways. 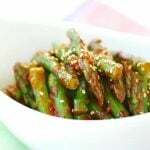 It’s important not to overcook the soybean sprouts to retain its signature crunchy texture. Also, do not open the lid until the sprouts are cooked, or the raw bean smell will linger even after cooked. Kongnamul muchim is my absolute favorite. It’s nutty, crunchy, and delicious! You may also like a soup made with soybean sprouts, kongnamul guk. Drain quickly, and cool. 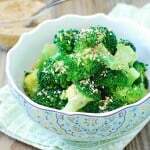 (You can shock the sprouts in cold water to stop the cooking for an extra crunch, but not necessary.) Toss with the remaining ingredients. Taste a little and add more salt to your taste if needed. Those meals that you have on this article look amazing. I use Sprouts for a lot of my own meals and it’s a wonder food in my opinion. 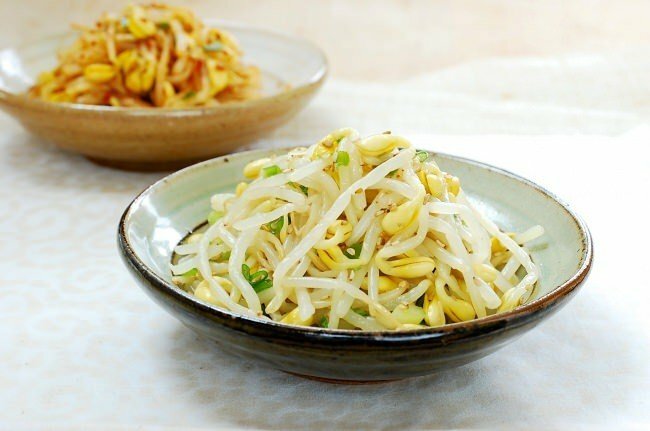 I love this dish, soy bean sprouts have a unique flavor compared to the regular sprouts. I am really going for the spicy version. thanks for sharing this. 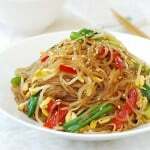 Thank you for the bean sprout recipe and taking the mystery out of Korean cooking. I love how you make everything seem so simple and yummy. Unfortunately, good soybean sprouts are not available in the stores where I live (we have similar looking sprouts, but they lack the yummy, nutty bean at one end). Have you ever tried sprouting your own at home, and if so, do you have any tips for how to do that? Hi erica – You’re probably talking about mung bean sprouts. Yes, I have. If you can find good soybeans, it’s really easy to sprout. I’ve been thinking about doing a post on that one day. Need to water 2 – 3 times a day. Keep them in a dark place, or the beans will turn green. When you are ready to start, e-mail me. I will give you more details. As a child, I would walk over to my neighbor who would grow these sprouts in their back kitchen area. Brings such fond memories of my childhood in Korea! 🙂 These look wonderful, Hyosun! Oh I just love sprouts. Thanks so much I look forward to trying both of your recipes. Ooh, I love bean sprouts! Can’t wait to try this! Is this one serving or enough to share? Hi Dana – This will be enough to share, especially as a side dish. Thanks for coming by. Enjoy! 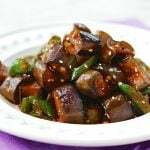 This is one of my favorite side dishes at all time. So simple, light, refreshing and delicious. I love it with or without chili flakes. I remember the first time I made this dish by myself and ate it all at one sitting (4 potrions!). It was that good! Hyosun, this is one of the biggest discoveries in a life of someone who adores soybean sprouts! I have them very often in salads, sometimes in stir-fries, but this Korean way of serving them is simply extraordinary! One more Korean recipe to make very soon. The spicy one is my favorite Korean condiment apart from poggi kimchi. Thanks for sharing your recipe with us. I will definitely give it a try. I would like to compliment you on your blog. It is wonderful. I have always been curious about Korean cuisine and you present beautiful photos and precise instructions. I was wondering about this kongnamul dish, should you eat it right away or does it taste better made the day before? 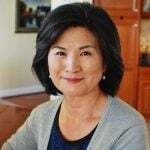 Hi Yvonne – Thank you very much for your kind words! I like it better when it’s freshly made, but it will taste still good the next day. I made too much of these… How can I use the leftovers? 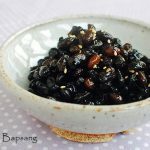 Make kongnamul bibimbap. Add some gochujang sauce (see my bibimbap recipe) and some sliced kimchi if you want. It will be delicious. In fact, that’s what I did with my leftovers from this post. Hope you like it! Hi Hyosun…since I found your website a month ago, I’ve made this 3 times…I loooove this dish! Thank you for sharing all the wonderful receipes…I plan to try all recipes without meat. Also, I really appreciate the beautiful photography. Keep up the wonderful cooking! Thank you! Glad you liked it. I love kongamul too. Hello. I was wondering how long these keep in the fridge if I store them in jar? I loveeee these and wanted to include them in my weekly meals prep for lunch. I usually use it for 3 to 4 days. It’s great to make it once and serve with your meals for next several days. The beauty of Korean side dishes! Enjoy! 7 minutes it’s too long. The sprouts can’t stay crunchy. Hi Chu — Up to 4 days! Enjoy! How long do the sprouts keep in the fridge after you’ve cooked and seasoned them? Awesome! I want to prepare some side dishes for when I don’t have much time to cook (preparing rice is so quick), so I wonder how long this will hold itself in the fridge? Depends on which one, but kongnamul should be good up to 4 days!